News | Spectrum Industries Inc. Introduces the Pivot Premier | Spectrum Industries | Digital Resources, Inc. Spectrum Industries, Inc. is a provider of innovative, quality instructional and corporate furnishing products, with a focus of meeting all your technology needs. Founded in 1968 and proudly headquartered in Chippewa Falls, Wisconsin, where all products are designed and assembled, Spectrum has gained a strong reputation for producing quality products in an environmentally responsible manner. 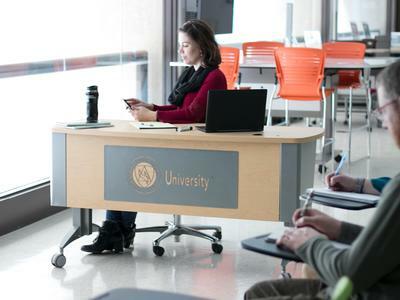 CHIPPEWA FALLS, WI, Feb. 5, 2019 – Spectrum Industries Inc., a premier manufacturer of school furniture products, is proud to announce its newest workstation, the Pivot Premier. The Pivot Premier is a sit-to-stand ADA Compliant workstation with whisper quiet eLift legs and features a large worksurface available in widths of 48” and 60”. This new workstation by Spectrum has many optional accessories that can be added to it. The Pivot Premier has the ability to hold AV equipment in its optional six front and six rear rack, an optional keyboard tray, an optional power module, and an optional panel to feature your school’s mascot, slogan, or logo is also available. The Pivot Premier’s feature-rich design has been built to stand the test of time due to its heavy steel construction, scratch-resistant powder coat, and high pressure laminate worksurface. Founded in 1968, Spectrum Industries is located in Chippewa Falls, Wisconsin, and is a premier niche furniture manufacturer. The high quality manufacturer has produced over 4,300 different products and can be found in any education, government, healthcare, or corporate setting. Spectrum creates products that connect people with technology. Spectrum has received ETL Certification by Intertek to UL 60950-1 listing and is ISO 9001:2015 certified. In addition, Spectrum was honored with the SCS Indoor Advantage Certification. This certification verifies that Spectrum is compliant with ANSI-BIFMA, a furniture sustainability standard.